Jimmy Carr was born in Limerick, Ireland to Irish parents. He first started developing his “massive brain” at Burnham Grammar and later at the Royal Grammar School, High Wycombe where he achieved an impressive 4 A grades at A-level, before going on to receive a first in Social and Political Sciences from Gonville and Cambridge. Jimmy left college and got his first job as a marketing executive at the oil company Shell, which he described as “The easiest job in the world”. Two weeks later he took redundancy and joined JC Productions Ltd to begin a career in comedy. Working with JC Productions and his dad, he made his first film at Pinewood called The Colour of Funny. The film was a complete flop and Jimmy motivated himself to try his hand at stand-up. He eventually got recognition at the Royal Variety Performance and in 2003 and won the Royal Television Society Award for best on-screen newcomer. 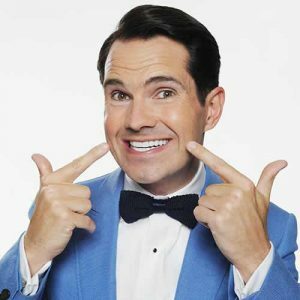 In 2004 he released his first stand-up DVD called Jimmy Carr Live and followed up the tradition next year with another stand-up DVD called Jimmy Carr Stand Up. Both DVD’s have sold over 150,000 copies. Today he is one of Channel 4’s most recognizable faces and has hosted a number of popular shows such as Distraction and 8 out of 10 Cats, as well as several specials such as The Big Quiz of the Year and The Comedians’ Comedian. Jimmy has also made headway in the US, performing four times on NBC’s Tonight with Jay Leno and three times on NBC’s Late Night with Conan O’ Brian. As far as the big screen goes, Jimmy has appeared in the films Confetti, Alien Autopsy and Stormbreaker. He has also hosted a weekly radio show for London’s local station XFM.